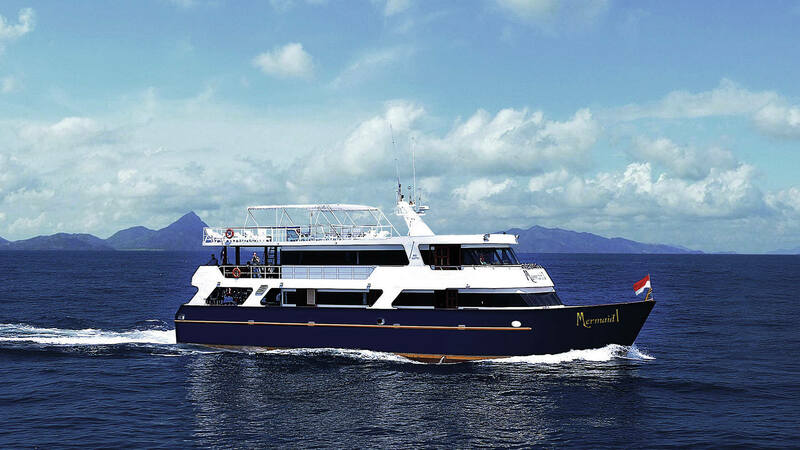 Liveaboard diving in Komodo and Raja Ampat Indonesia with the luxury Mermaid I. Since June 2011, Mermaid I has been permanently based in Indonesia, making liveaboard cruises to Komodo and also to Raja Ampat. 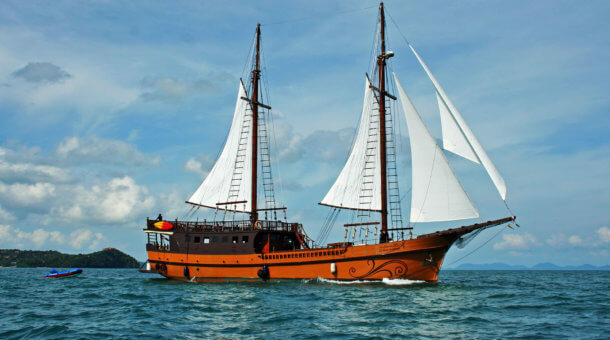 The Komodo trips depart from Benoa Harbour, in the south of Bali. The dive sites in this area are equal to any in Asia, with Komodo in particular being a very popular liveaboard destination with big fish, exciting currents, deep drop offs and many small rare critters. Raja Ampat trips depart from Sorong and there are special crossing trips between the 2 destinations several times per year. NOTE: Mermaid 1 also runs a few longer trips and crossing trips between Komodo and Raja Ampat. Prices increase from January 2020. Check the schedule below for a full price list! 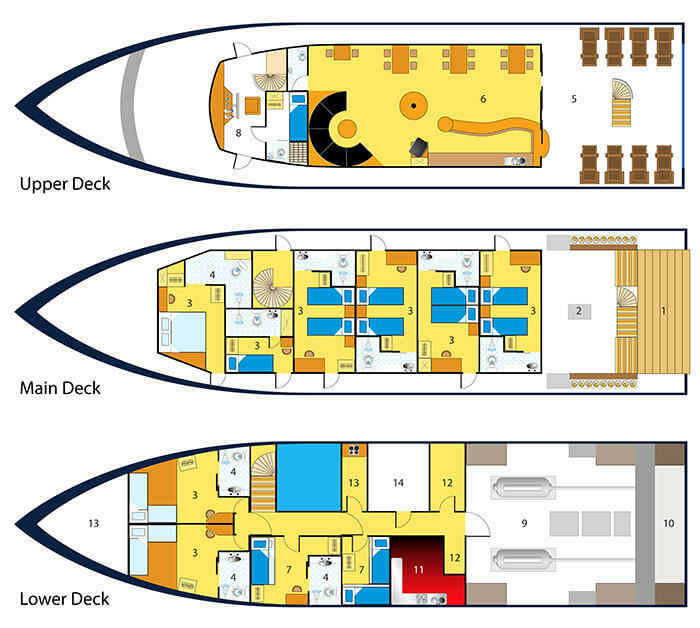 Mermaid 1 has several different cabin types, all with private bathrooms and hot water shower. There is one double bed Master cabin at the front of the boat – the largest cabin on the boat. There are 4 Deluxe twin and double bed cabins, and one single bed cabin. On the windowless lower deck are 2 “Budget” twin bunk cabins – great if you are on a slightly lower budget! The food on board is excellent, featuring an a la carte menu with a wide choice of local and European dishes. Nitrox is available on board; tank fills at 6 Euro per tank (discount if using Nitrox for the whole trip) or you can also get Nitrox certified during the cruise. 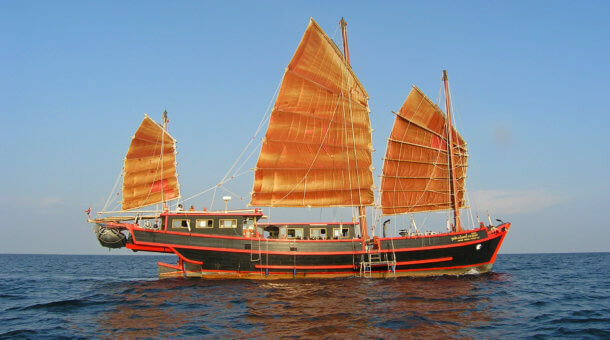 The Mermaid 1 is one of the few steel hulled boats operating in the area and is one of the most comfortable liveaboards operating in Indonesia. She is also a fast boat, meaning cruising time is reduced and more remote sites are easily within reach. All cabins have air conditioning, TV and DVD players, bathrobes, toiletries and fluffy towels. The huge dive deck and wide dive platform with two exit ladders and fresh water showers are a diver’s dream. There are also 6 camera rinse tanks. Meals are served in the “restaurant” with large windows to enjoy the views and there are also BBQs on the trips. The large indoor saloon has TV/DVD and music center, plus there is an extensive library and wide range of marine life books. You’ll find a shaded area with outside seating and also a sundeck with sunshade plus cushioned sun beds – Mermaid 1 is a place to dive and relax! Rental equipment is provided on board the Mermaid 1 liveaboard. Any rentals you need, please book in advance. Rental rate 18 Euro per day for a set (BCD/regulator/wetsuit/mask/fins) – 5 Euro per day for a dive computer. Dive torches and 15 liter tanks, no extra charge. Nitrox is available on board @ 6 Euro per 12 liter tank fill or 130 Euro for a full 9 night trip. Mermaid 1 runs trips year round in Indonesia, mostly in the Komodo and Raja Ampat area, though there are also special crossing trips between these 2 destinations and also a few longer trips which include the Banda Sea, Ambon, Lembeh and Halmahera. We can provide itineraries on request for any trip in the schedule. DAY 2 Start with a great dive in the calm, clear waters of Angel Reef at Moyo Island. Enormous elephant ear and barrel sponges, schools of long fin banner fish and red tooth triggerfish in their hundreds, frogfish, nudibranchs, eels, surgeon fish, snapper, dog tooth tuna cruising for a snack! Visit the local village then lunchtime! Cruise to Satonda Island for a macro dive and a world class night dive after watching a million bats fly at sunset. After dinner cruise overnight to Sangeang Volcano on the north coast of Sumbawa Island. DAY 3 Today Mermaid 1 will spend the day diving around Sangeang Volcano – 2 or 3 dives for rare macro life – nudibranchs, pygmy seahorses, leaf scorpion fish, blue ribbon eels, this is volcanic sand diving! A very unique marine environment. 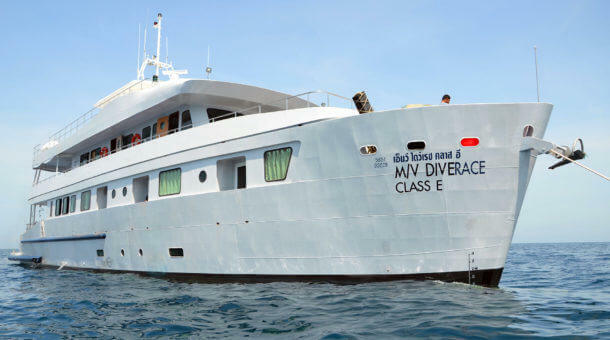 Night dive here also or cruise to Gili Banta for the chance for stargazers and coral cat sharks. DAY 4 Start the day at GPS Point, Gili Banta famous for sharks and pelagic fishes. Then enter the Komodo National Park for more amazing diving! Gili Lawalaut has several dive sites – if the tide is right you can look for grey reef sharks and dolphins! Lighthouse Reef and The Old Passage offer drift dives with many pelagic species, and a chance or manta rays. Crystal Rock features gold and orange soft corals plus maybe sharks, turtles or giant Maori wrasse. Night dive at Pink Beach – crazy colours and likely to see frogfish, slipper lobster, basket stars, sea cucumbers unique to the area. DAY 5 Start the day with a landing in Komodo National Park to walk with the Komodo dragons! Then cruise south to dive Three Sisters or Pillarsteen at Padar Island. Next stop – Horseshoe Bay at Rinca Island – here you can find one of the top 10 divesites in the world – Cannibal Rock – huge variety of coral, sponges, sea squirts, rare black corals, turtles, cuttlefish, and an abundance of reef fish too! You may also see dragons scavenging on the beach, monkey, deer, wild pigs along the shore. Sometimes there are whales and dolphins feeding in the bay. Overnight at this peaceful paradise. DAY 6 world class dives today in Horseshoe Bay, Rinca Island – the Yellow Wall of Texas is beautiful – covered with huge yellow soft corals. Dive slowly along the wall searching for unique creatures and also look into the blue or you might miss something big! Chance to make a deep dive here, tiny yellow pygmy seahorses are often found on the giant gorgonians at depth. Nusa Kode features more walls and critters plus white tip reef sharks! Torpedo Alley is renowned for “electric” rays and there is a great night dive for macro lovers. DAY 7 Today head to Manta Alley to see these magnificent creatures feed, play and visit the many cleaning stations. In the afternoon are more big fish dives maybe at Loh Serah, Tatawa Kecil or the infamous “Current City” – you may see reef sharks, turtles or giant Wrasse. Night dives are good here – Gili Lawa Darat is a place to find sleeping turtles, reef stonefish, spanish dancers and with calm season, always a good place to sleep. DAY 8 The diving around Gili Lawa Laut, Tatawa Kecil and Gili Lawa Darat is superb – make 2-3 dives in clear, warm blue waters – loads of fish of all sizes here. Then your night dive at either Gili Banta or maybe Batu Putih, Sumbawa. During the night cruise back to Satonda and Sumbawa. DAY 9 Last 2 dives of the trip around Sumbawa and Moyo Islands – a chance to snap photos of anything you missed at the trip beginning. The ever attentive crew wash your equipment for you while you relax on the sundeck or download your pictures, enjoying our trip video as well just before dinner with all your new friends. Cruising back to Bali. ARRIVAL DAY At Benoa Harbour, Bali. Breakfast and then transfer to hotels or airport. Note : This is an approximate itinerary. 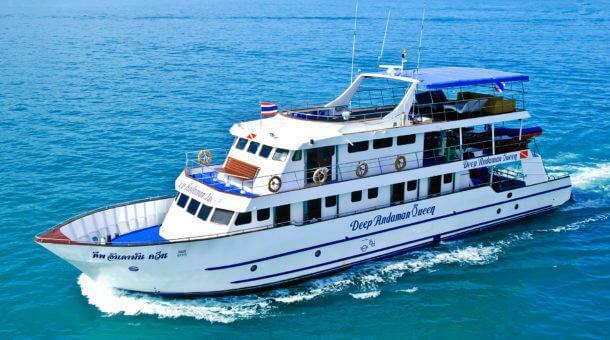 The 9 night trips include about 28 dives. Exact dive sites will vary from day to day. For more itineraries, please do contact us, or send a trip enquiry and we’ll send full trip details.